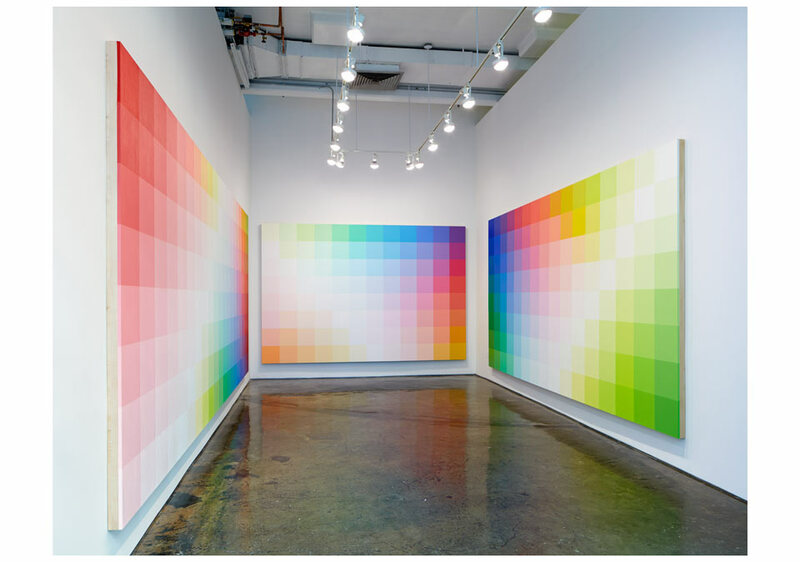 MINUS SPACE is delighted to present the exhibition Robert Swain: Color as Color. 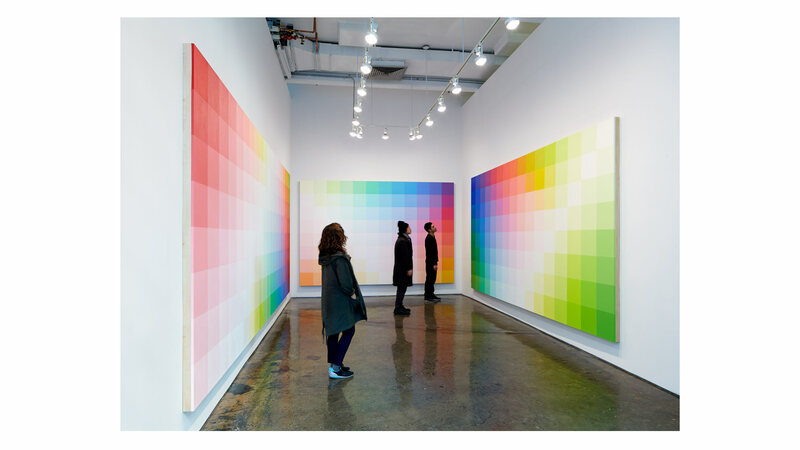 This is the New York artist’s third solo exhibition at the gallery and it will feature a suite of new large-format color grid paintings. 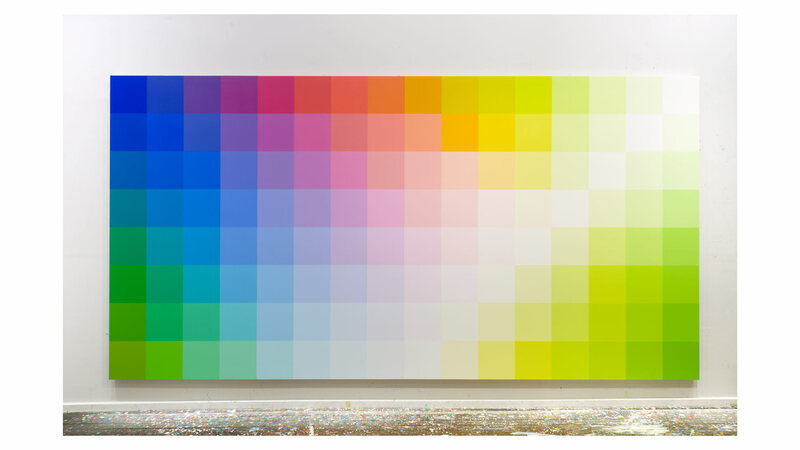 For his exhibition, Swain will present an immersive installation of three new horizontal paintings sized 8 x 12, 8 x 16, and 8 x 20 feet respectively, in which squares of pure color are arranged into grids that are subtly modulated by hue, value, and saturation. 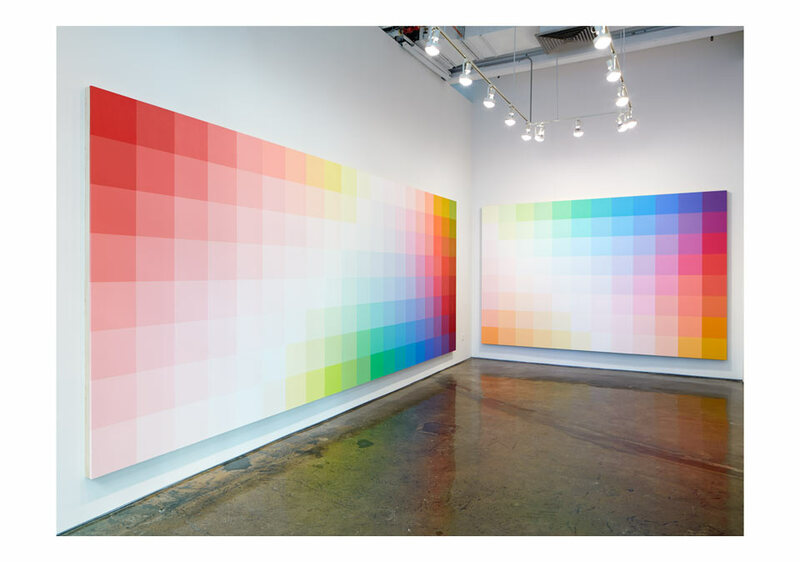 The paintings are Swain’s latest investigation into the color system he has developed and refined over the past 50 years. 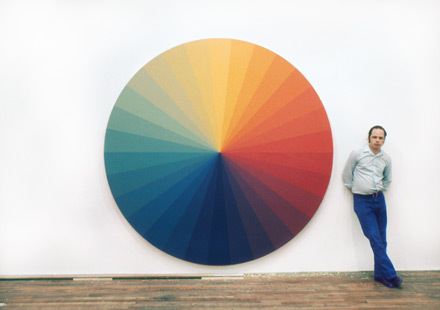 The catalyst of his system is a 30-part color circle. These colors, when combined with the qualities of value (the lightness or darkness of a color) and saturation (the pureness of a color), produce a complement of 4,896 distinct hues, from which Swain conceives his paintings. For further information about the exhibition and available works, please contact the gallery. Available works can also be viewed on our Artsy page: www.artsy.net/minus-space. Robert Swain is one of the most influential artists of his generation. He was born in Austin, Texas, in 1940, and grew up in Arlington, Virginia. During high school in the late 1950s, he spent his summers in Guatemala and Nicaragua working on the Pan-American Highway. He attended The American University in Washington, DC, where he later received a BA in Fine Art in 1964. During his undergraduate studies, he spent two years in Madrid, Spain, studying at the University of Madrid. In 1964, he moved to Provincetown, Massachusetts, and worked as a studio assistant to the American Modernist painter Karl Knaths. Swain moved to NYC in 1965 where he permanently settled in Manhattan’s Tribeca neighborhood. 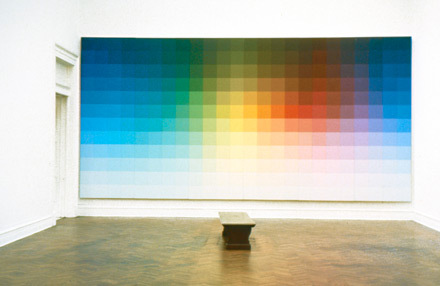 In 1966, Swain began his first color-based work followed a year later by his first work utilizing the grid. He participated in his first group exhibition, Light and Line, organized by John Baldwin at the legendary Park Place Gallery in NYC in 1967. That same year he met sculptor Tony Smith who became his close friend and mentor for many years. 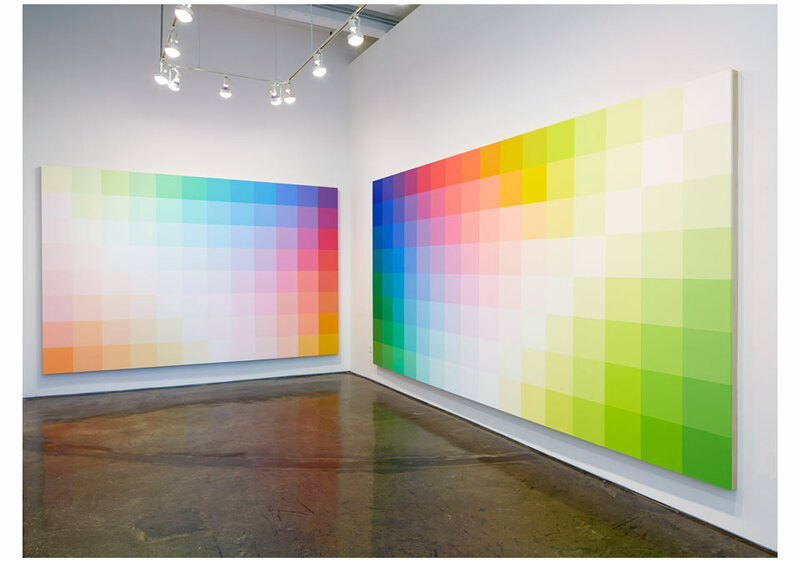 In 1969, Swain began to develop his own color system, a project that continues until today. Swain has exhibited his work nationally and internationally for more than 40 years. His paintings have been including in countless landmark exhibitions. He participated in the seminal exhibition Art of the Real curated by Eugene Goossen at the Museum of Modern Art, NYC, in 1968. The exhibition traveled for the next two years to the Grand Palais, Paris, France; Kunsthaus, Zurich, Switzerland; and The Tate Gallery, London, England. 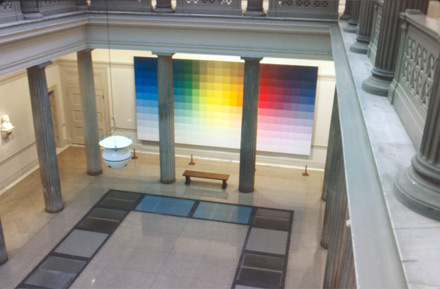 Swain exhibited in The Structure of Color curated by Marcia Tucker at the Whitney Museum of American Art, NYC, in 1971. In 1974, he mounted his first solo museum exhibition at The Everson Art Museum, Syracuse, New York. In 1974, he participated in Color as Language curated by Kynaston McShine and organized by the International Council of the Museum of Modern Art, which traveled throughout Central and South America, including to the Museo de Arte Moderno, Bogota, Colombia; Museo de Arte Moderno de Sao Paulo, Brazil; Museo de Arte Moderno, Rio de Janeiro, Brazil; Museo de Bellas Artes, Caracas, Venezuela; and Museo de Arte Moderno, Mexico City, Mexico. His work was also twice included in the Corcoran Biennial at The Corcoran Gallery of Art in Washington, DC (1969, 1998). Swain’s work is represented in nearly 300 public and private collections, including the Metropolitan Museum of Art, Corcoran Gallery of Art, Walker Art Center, Albright-Knox Art Gallery, Milwaukee Art Museum, Denver Art Museum, Detroit Institute of Art, Everson Art Museum, Virginia Museum of Fine Arts, and Columbus Gallery of Fine Arts, among others. He has completed major commissions for IBM, Johnson & Johnson, American Republic Insurance Company, Schering Laboratories, Harris Bank, Travenol Laboratories, Tupperware World Headquarters, and the University of Buffalo. He has received awards from the John Simon Guggenheim Memorial Foundation, National Endowment for the Arts (1976, 1989), New York State Council on the Arts, and the City University of New York. In addition to his artistic work, Swain taught in the Department of Art & Art History at Hunter College from 1968-2014, where he educated and mentored countless generations of artists. For his teaching, he was awarded the Distinguished Teaching of Art Award from the College Art Association in 1998. 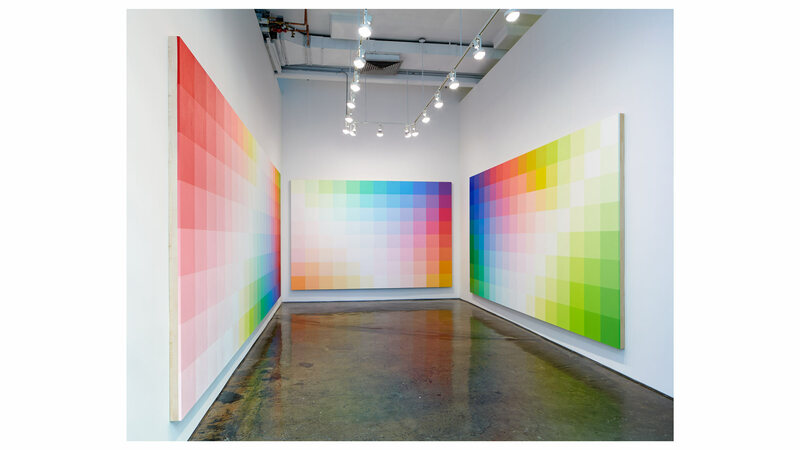 In 2010, Swain was the subject of a major 45-year survey exhibition entitled Visual Sensations: The Paintings of Robert Swain curated by Gabriele Evertz at Hunter College/Times Square Gallery, NYC. In 2014, he installed a major exhibition of large paintings entitled The Form of Color at the Santa Monica Museum of Art, Santa Monica, CA, curated by Jeffrey Uslip. Acrylic on Canvas, 30 x 90 in. Both Acrylic on Canvas, 7 x 7 ft. Painters have always been interested in color, for pigment is one of their principle materials. Any discussion about the colorists among them could begin with Giotto, for example. But color served as an index and a sign; in painting it was used as local, or surface color, as a means to identify a depicted object. Painting has a long memory, but in the twentieth century—relatively recently—a break occurred, namely the advent of abstraction. This development allowed color to free itself from its subordination to objects and to emerge as an autonomous element in painting. Artists began developing an entirely new language, one that still awaits its analytical and critical assessment. Around the same time, new scientific investigations of color perception were published. The study of the perceptual properties of color is founded on the biological basis of artistic behavior. With the revolutionary techniques of Positron Emission Tomography (PET) and Magnetic Resonance Imaging (MRI), during the 1970s and 1980s the study of the human brain became possible, and by the 1990s MRI technology was monitoring neural activities in “real time.” We painters discovered that the seemingly countless variations among color’s mysterious sensations—though dauntingly difficult to enumerate—could be studied systematically, as many of their psychological and physiological causes were finally being revealed. How, then, does a young painter go about setting up his studio to make abstract color paintings? 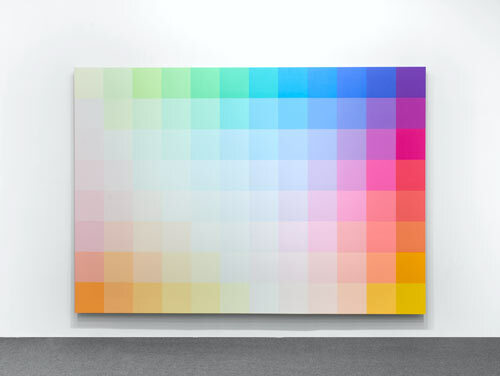 When Swain painted Untitled #1 in 1967, a thirty-by-ninety-inch painting that consists of five rows of seventy-five discrete color squares, organized in a grid formation of modulated hues—ranging from intensely glowing saturated colors at the top to largely unsaturated colors at the bottom—he had deliberately addressed and controlled the three dimensions of color, namely hue, value, and saturation. He could have stayed there, content to keep making these very satisfying paintings. But Swain was interested in color phenomena. When he painted the larger-than-life-size tondo, Red and Green Color, in 1969, he applied red and green, which are direct complements, of similar value in a brushy manner. The afterimage heightened both colors dramatically, offering a well-known and predictable effect. But there occurs a second effect at their horizontal border, a flickering halo of intense light, known as the Mach band. A third effect ensues, as colored light intermixes to a medial sensation, known as the subjective gray, at the bottom and seems to work its way up, as if a cloth was unfolding upwardly. hese sensations are fleeting but powerful. They involve eye, mind, and body. It seems that paintings like this one set the course for Swain, and he devoted himself in subsequent years to unlocking the mysteries of perception. To do so, he had to turn inward and find a personal approach, his own language of color. 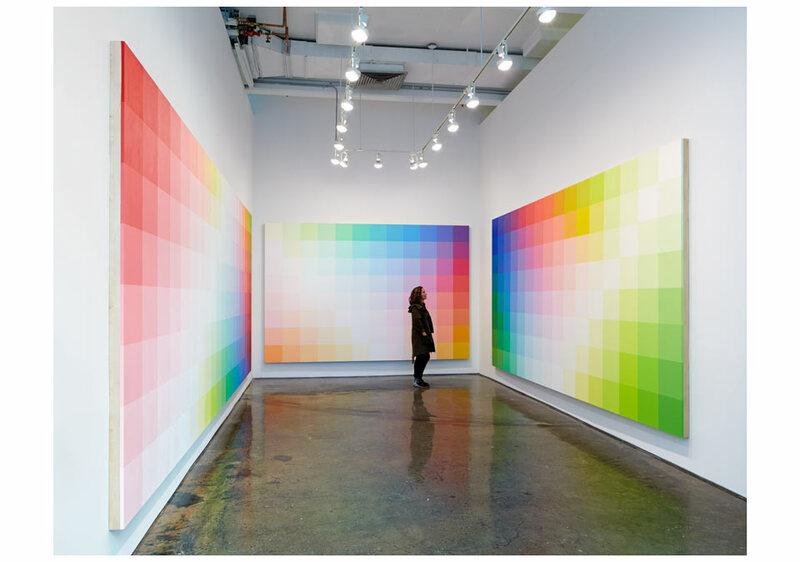 How, then, does a painter find and determine color relationships? The most straightforward expression of these is the color circle, and Swain proceeded to paint several versions of it with an increasing number of segments, beginning in 1971 with a twenty-four-part wheel that had an eight-and-a-half-foot diameter. It is interesting to note that the color yellow is placed at the top center in several of these early works, such as the color wheel studies and his Untitled #1 of 1967. As an organizing principle this choice is perhaps indicative of Swain’s particular sensitivity toward the polarity of tonal light/dark values. 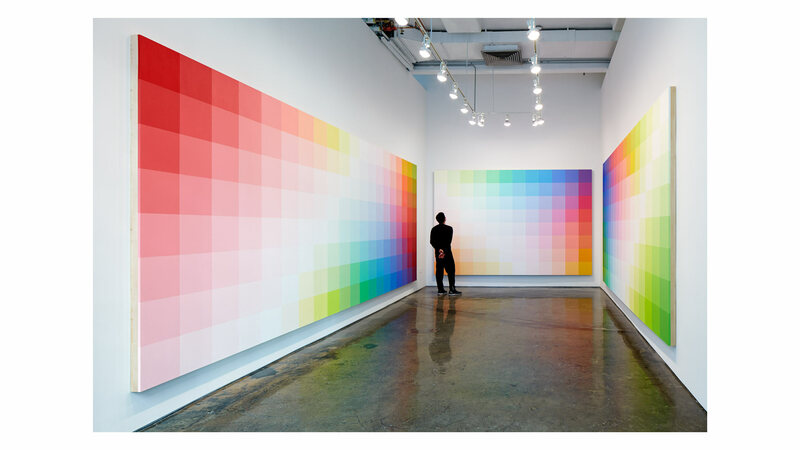 And it is one of the reasons why his early work can never be confused with color charts: it always involves a spatial dimension. 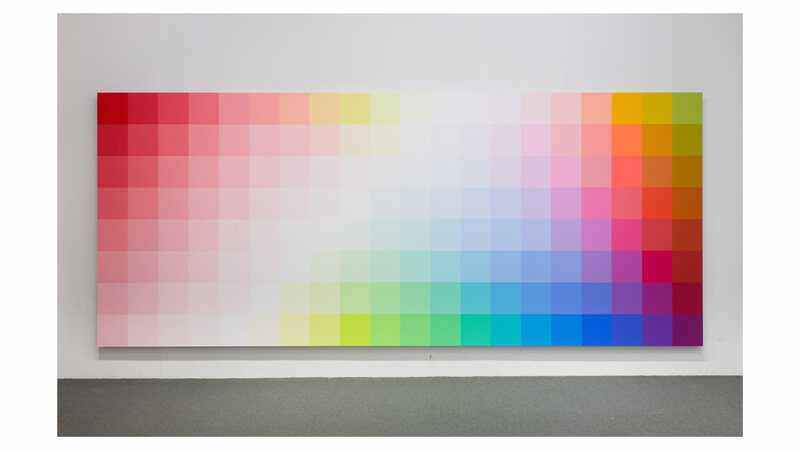 Over the years, in an effort to gain insights afforded by his practice into the ever-expanding vocabulary of color behavior and effects, Swain has devised a catalogue of close to five thousand color samples. Organized according to his unique numerical system, these color chips are carefully filed in narrow drawers in his studio and serve as aids in formulating color relationships for his paintings. It becomes self-evident that Swain’s concern is neither to expose the hierarchy of colors nor to illustrate a theory or symbolism of cultural codes. Rather, his impulse stems from the desire to make us see, and thus feel and think, color at its most active, existential, and most refulgent. His works are not immersive. Instead, factureless and painted in precise, modular grids, they demand a practice of looking with heightened attentiveness that engages us completely in the disquieting visual, cognitive, and intensely sensuous experience of color’s constant flux. Our reward? There is knowledge and understanding to be gained by active and attentive looking. For instance, Swain seems to favor the two extremes of color organizations: contrasts and assimilation. Similar colors have the tendency to group together—we call them analogous colors—while complementary colors contrast and heighten each other’s presence. Here reality and the sensation of color collide. When contrasting colors are precisely painted with a focused, definitive edge, they will not only create phantom lights that seem to come forward into the viewer’s space but also create two ways of seeing color; one of which is the “true” color (seen at the center of the shape) and the other a kind of flickering around the edges where multiple colors meet. Diffused or unfocused edges, as in the paintings by Mark Rothko, for example, cause the viewer to “move” into the picture space, a way of viewing paintings familiar since the Renaissance. On the other hand, if we are patient and quietly observe Swain’s paintings from varying distances, they can lead us to a new understanding of color painting: we are invited to participate in the complication and fluidity of color experiences that appear to change, move, and glow with heightened intensity. But the colors also come to rest again as the individual shapes take their turn at the center of our attention. Since viewers create these effects within themselves, each may experience them at slightly different times and in varying spatial modes of appearances. Such effects are considered intensely private experiences and therefore it is tempting to associate these paintings with religious or mystical states. The contemplation of Swain’s paintings, while they always retain their own identity, provokes a concentrated, even heightened awareness of our direct access to our own consciousness. And for Swain, each of his paintings is hard-won in this way, by empirical investigations of color’s behavior, its relationships and interactions. Swain selects individual colors by looking at one given color, say a saturated orange, and then attentively waiting for its complementary partner, a certain saturated blue, to emerge in his mind’s eye. The same method holds true for his “Value” paintings of black, white, and gray. Color painters consider the achromatic tones of black, white, and gray as colors since they are subject to similar psychological effects as chromatic tones, but only their brightness changes within the context of a painting. Once the color structure is determined by Swain’s choice of the colors’ location and quantity, a particular and unique color expression is arrived at. After he has mastered this set of relationships, he subtly altered his considerations—and entered a new phase of work. During the 1980s, for example, he broke down the compositional structure of his paintings into differently sized blocks of colors. They were still set in relation to each other, but were shifted around. Some works were organized according to the Golden section, a mathematical ideal that, Swain said, came to him intuitively. Phenomenological energies can be experienced as well when we look at Swain’s large-scale mural work. This involves peripheral vision. While we observe the center of the painting, its edges can only be sensed and the colors seem to blend in motion. Throughout the 1980s and 1990s Swain explored subtle but innovative adjustments to the scale and the size of individual elements, their order and configurations. Each painting exists on its own terms; nothing is arbitrary in this work. Its structure arises purely from formal or expressive considerations generated by its component parts. It takes awareness, time, and imagination to figure out the individual experiential sensations these paintings evoke. It is up to viewers to enter into a dialogue with the work. Inspired by new insights, in 2006 Swain set out to radically change his style. With this new body of paintings, he returned to earlier problems that had been abandoned for want of clarity. He revisited his efforts from the mid-1960s, when he attempted to combine the irregular shapes of the brushstroke with particular color concepts. It was a way to grapple with the heritage of Abstract Expressionism. But this new work is not merely a cultural citation. To Swain, all his previous work began to appear passive. It seemed to evoke a certain kind of quietness, if one can manage to disregard the often bright color. A quietness or equilibrium, due perhaps to the vertical and horizontal divisions of the pictorial field. But this new body of paintings, he decided, would be given open structures of irregular lines that mimic brushstrokes. And in them, viewers can discover discrete elements of curved structures, repetitive units of individually jagged edges, and torn shapes unlike any encountered in nature. Almost always organized from top to bottom and diagonally across the picture plane, Swain’s shapes reduce in size as they descend toward the lower left of the composition. Suddenly, afterimages appear within these shapes due to the effects of successive contrasting pairings. Their movement and frequency of pace creates the tension between control and aliveness of the paintings’ surface. 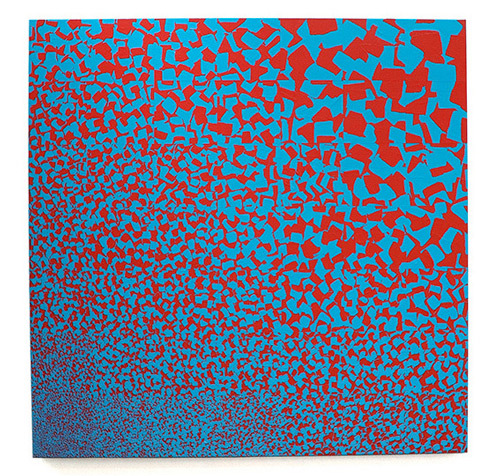 Swain’s earlier concern with color contrasts has expanded in this new body of work to include the “active shape.” Tensions arise, not just on the surface, but between such applicable characteristics as expansion and contraction, static and active, accumulation and dispersal, and the cross-blending of fields and structures. Every visual element is run through every possible permutation. These new works read as dynamic fields without referring to landscapes. Further, the jagged edges of the “brushstroke” shapes are applied in thicker layers of impasto, and their shadow line lends an additional visual element, further rendering unique each new painting. And even in paintings where we discern not more than three colors, they are set into a disruptive contrast by the closeness in value and hue relationships and varying distribution of changes in size, quantity, and location. 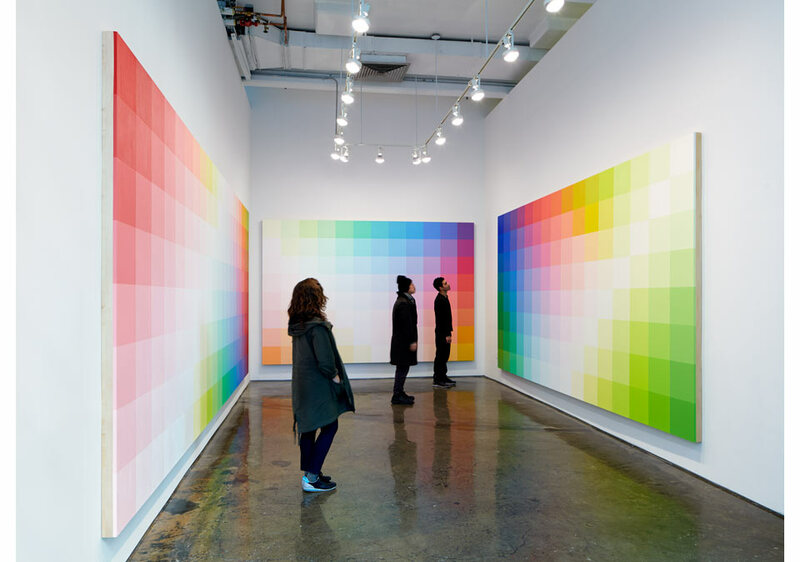 In the former work, viewers could observe in time all the apparent movements of immaterial, merry blocks of light and color in their stimulating, advancing, and receding restlessness. 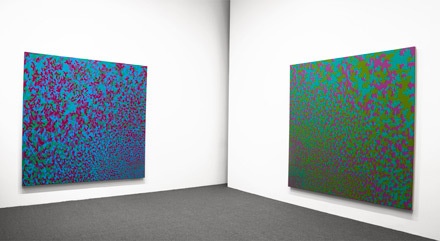 These new canvases ask viewers to engage with the materiality of color as paint, something visceral and physical, the “physical fact” that Albers spoke of in relation to “psychic effects.” Reduced in number, the colors still emanate light and sensation, as, for example, in an untitled 2007 painting, a seven-foot-square canvas that consists of the split complementaries of red-violet, yellow-green, and blue-green median value. They are distributed in an all-over manner, in dramatically decreasing marks as they approach the lower left of the painting; the effect is of a fan-like spread. At that corner small patches of colors of a close value tend to mix optically. But when the texture is too coarse, the pure complementary hues create a phenomenon called complementary vibration, whereby the constituent colors seem to repel each other and cause optical movement or vibration. Observe the lower left areas of this canvas carefully. Which is it? Optical mixture or optical contrast? Scanning the entire surface, viewers notice a distinct sensation of everything being animated. The agitated lines of the brushstroke shapes, as they shrink in size, appear to collide with the colors that flare up in contrasting and successive afterimages of luminous light. At a heightened state of consciousness the tension is almost unbearable, the equivalent of an epic struggle: shape and color are enmeshed between states of emergence and resolution, existence and extinction, until closure sets in and all concern fades away. Painting can be comprehended only through direct experience. With these new works Robert Swain has achieved a visual expression that can be seen both all at once and in all its permutations. Viewers are presented with a series of particular problems that are solved differently in each individual work. His repertoire is vast. Swain has at his disposal a seemingly unlimited palette and his sequences of experiential sensations, such as simultaneous contrasts, after-images, and other induced effects, keep viewers in a reciprocal relationship with the paintings. Luminous shapes, brighter and more brilliant than the painted shapes that generate them, can be observed to appear, disappear, reappear, or cyclically fade out as our color-sensitive cones become fatigued. Swain has pushed the limits of perceptually functioning art from a gentle but lively impression of individually interacting color phenomena to a more aggressive and energetic fusion of cause and effect. The result is a new color expression that can reach all of us since we share the biological make-up to perceive it. But its experience is individual and private, taking us beyond visual sensations to our own radiant universe. 2	To devote an exhibition to the experience of color in painting at this moment seems only fitting when we remember that Johann Wolfgang von Goethe’s seminal work on color phenomena, Theory of Colours, was published exactly two hundred years ago, in 1810. First trans. by Charles Lock Eastlake, London, 1840. First MIT Press paperback edition, March 1970. 3	Key texts include: Faber Birren, Color Psychology and Color Therapy (1950); Rudolf Arnheim, Art and Visual Perception (1954); Johannes Itten, The Art of Color (1961); Maurice Merleau-Ponty, The Phenomenology of Perception (1962); Josef Albers, Interaction of Color (1963); The Responsive Eye, exh. cat. by William C. Seitz, New York, Museum of Modern Art (1965) . 4	John Gage, Color and Meaning: Art, Science, and Symbolism (1999). The way we respond to color is similar to the way we respond to music: words fail us. Our perception and understanding of color slips from the realms of rational language, the sensations stimulate a different part of our brain, triggering emotions that may not be intellectually grasped, but are still tangibly moving. 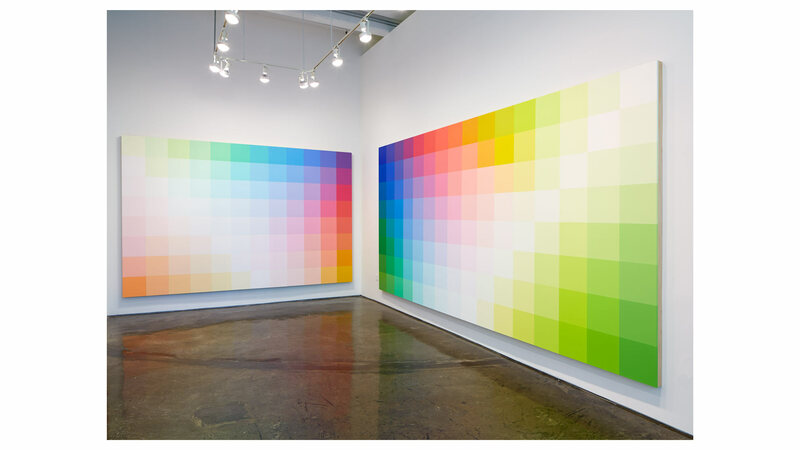 Robert Swain’s paintings are the result of an intense 40-year study of color perception. 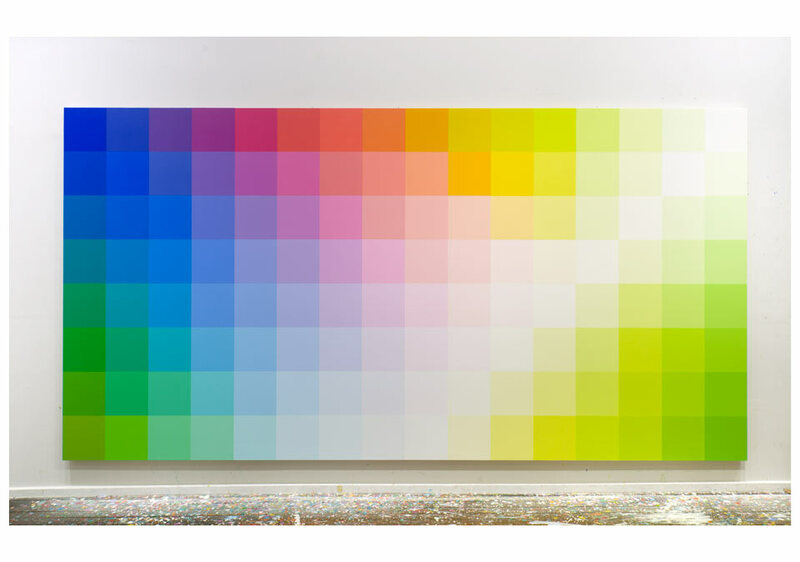 Standing in front of one of his 10-foot canvases, arranged in a mathematically formulated grid to minimize perceptual variables and making color interaction their main concern, there is no denying color has transcendent properties (Figure 1.). While the actual effects of color may elude description, there is a history of color theory that can help us speak of this experience. Much like the standardized notes of the diatonic scale, there are incremental measurements and nuances of color that reveal the system from which sensation arises. Color sensation is a more primal response than the narrative we construct around perception; it is free from cultural and personal encoding, though we may bring these ideologies into our final “read” of a painting. In this way, Swain’s paintings have the ability to strip away the constructs we create when taking in the world, instead directing our attention to the phenomenon of the world itself. This essay overviews the theoretical issues of Swain’s work to give us the tools to understand color as an independent subject. There are key objective and identifiable truths about color that help us understand how color functions. First, it is important to establish the objective scientific and subjective interpretive at the base of color perception. 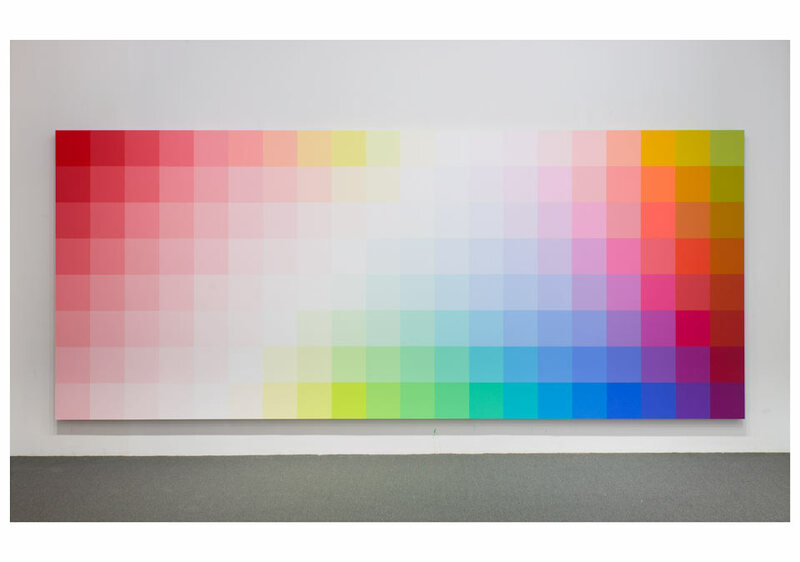 With that in place, we can turn our attention to the color system itself, which will give us the background of objective color measurement, as well as the observable color phenomena (or the interaction of color) of Swain’s work. Finally, there is an exploration of Swain’s latest artistic endeavors, both in relation to these terms and in comparison to his previous work. In talking about Swain’s paintings, there is a dual impulse. On the one hand, there is a perceptual response based on scientific fact. On the other, there is the subjective internalization of that perception. While a color in the world can exist, our observance of it and transmission from our eyes to our brain is central to our understanding of it. The works of Sir Isaac Newton and Johann Wolfgang von Goethe in their competing studies of perception and color best describes this duality. Central to any discussion of color is the notion that color is actually light. Sir Isaac Newton was the first to discover this in 1666 and to publish his findings in 1704, refracting white light through a prism in order to divide it into the separate colored wavelengths that make up what we call a spectrum. Newton found each particle moved at different speeds, red moving the fastest and violet the slowest. He then created the first color wheel based on his observation that the color sequence, as in the rainbow, is fixed and that violet blends into red. He represented the spectrum as a full circle, with red green and indigo blue at equal steps. We have since learned there were certain flaws in Newton’s classifications. Newton divided his wheel into seven primary colors: red, orange, yellow, green, blue, indigo and violet. In a spectrum, there are only five discernable separations of color in the spectrum. Newton’s addition of orange and indigo came from a desire to correspond the colors of the spectrum to more mystic sources. By corresponding color to the seven notes of the diatonic scale, Newton was relating an overall “harmony”. 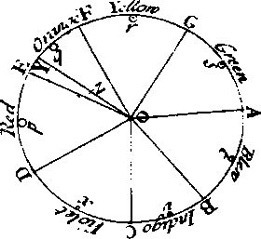 By dividing the color spectrum into seven colors, Newton was tying color to the diatonic scale in the tradition of Greek sophists, who believed there was a connection between the colors, the musical notes, and astrology as related to the calendar. Because the musical scale so easily and irrefutably divides into the magic number seven, so too should color. In his model of the color wheel, Newton shows how the colors correlate with musical notes and symbols of the planet. Newton thought anything as fundamental as color must correspond to the other fundamentals which sophists grouped into sevens: 7 sacraments, 7 deadly sins, 7 heavenly spheres, 7 days of the week etc (Burton, p.41). Nevertheless, without Newton, the science of light and color would not have been established. Apart from laying the grounds of color theory, Newton brought out the notion of color functioning as a light. At the root of Swain’s paintings is a belief in light. Swain juxtaposes certain hues with the expressed purpose of highlighting their light-emitting qualities. 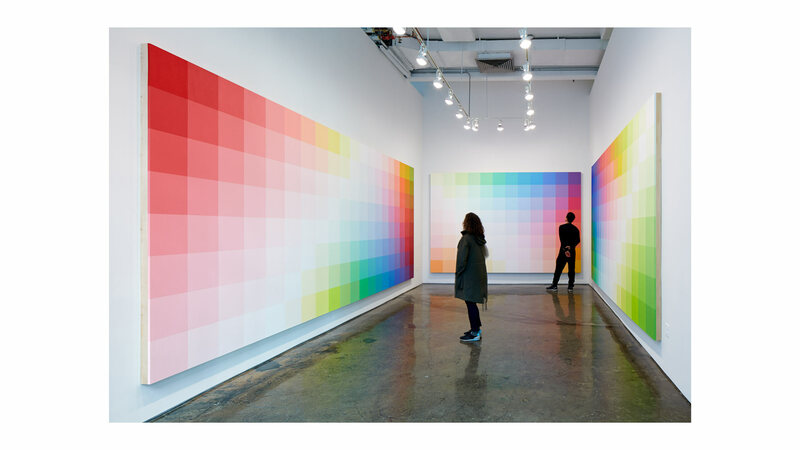 This creates a glow, as each square of the grid interacts with an adjacent square of different color, producing a myriad of effects as your eye moves across color relations (Figure 2.). 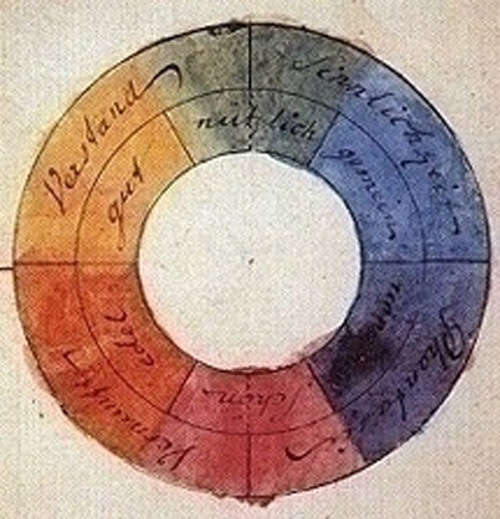 While Newton was important in establishing the science of color, Goethe brought attention to it from a more romantic and artistic perspective. He argued polemically against Newton’s concept of wavelengths and that there was no color in the physical world, only light and dark. The light patterns are discerned by our eyes and transmitted to our mind, where they are given color. This redirection of emphasis highlights the subjective perceptual (Birren p.105). It is what gives subject matter to color, making our experience of it meaningful in itself rather than a transmission of different wavelength frequencies. As Swain himself has said, “art is not about establishing scientific truths. It’s about establishing content for people” (Swain, March 18). 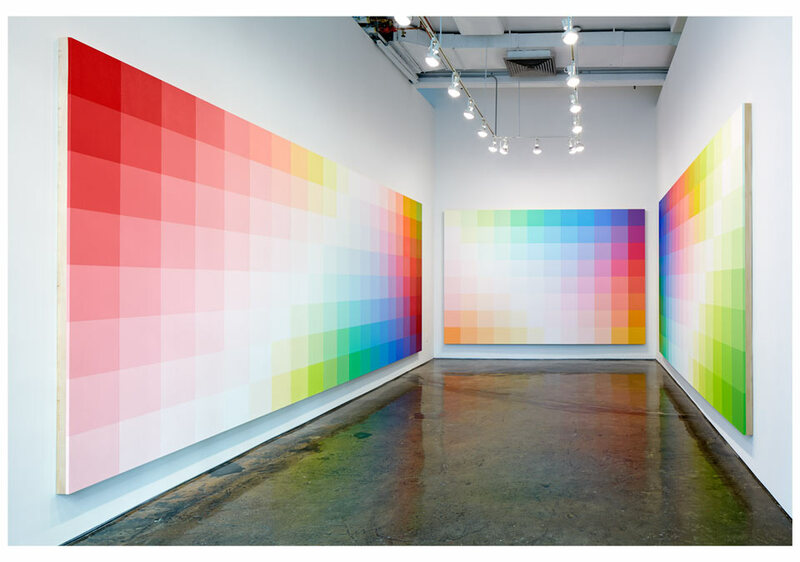 Swain’s art may rely on scientific phenomena to guide the effects of color interaction, but at the end of the day it is the content of color that is his interest. This moves his work from a textbook description of perception to the actual experience. With the groundwork of the scientific objective and subjective interpretive established as a double force in looking at Swain’s work, there must be a way of measuring and delineating the colors themselves before gauging the effect of their interactions. For this, a color system must be in place to clearly show the gradation of color. There have been many different color systems created, but two are of extreme importance when looking at how Swain derived his own: Albert H. Munsell and Wilhelm Ostwald. 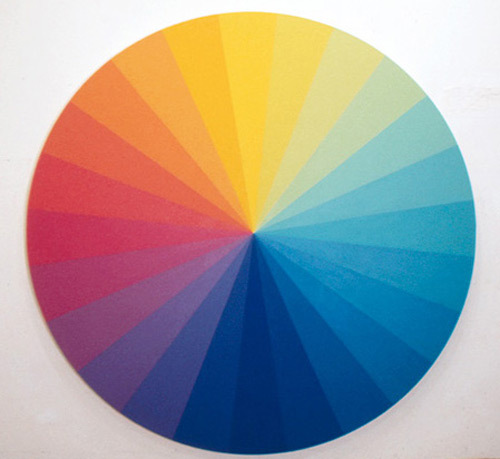 Ostwald’s color wheel consists of 24 equidistant steps with eight principle hues (yellow, orange, red, purple, ultramarine blue, turquoise blue, sea green, and leaf green) each with three steps. The color solid has a gray scale as the central axis, with colors increasing in purity toward the equator and thirteen steps of gray between the gradients of black and white. 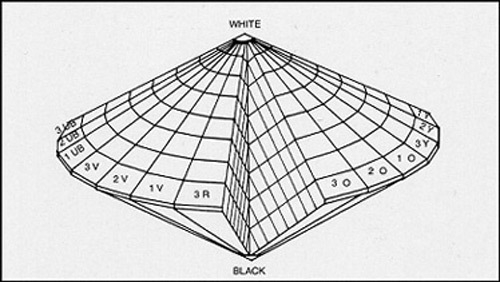 Organized three-dimensionally, each hue variant is located in a double cone shape, the hues are distributed horizontally and the white at the top and black at the bottom (Stromer, p.129). It is important to note that Ostwald forced his colors to fit into the geometric model, working his color sensations from the outside toward the gray column. In comparison, Albert Munsell’s system, (Atlas of the Munsell Color System, 1915) moves outward from the gray scale with perceptually equal steps and therefore takes the shape of a distorted sphere. 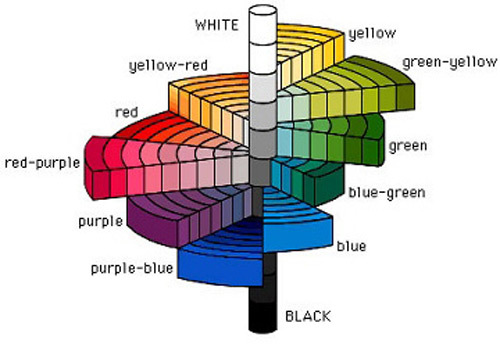 Munsell’s system describes the three dimensions of color by hue (the actual color), value (the lightness or darkness) and saturation (the color’s intensity, or chroma, written as H V/C in the Munsell notation) (Stromer, p.125). Again, it is easiest to grasp the variants when looking at the model three-dimensionally, in order to see the corresponding value changes between colors. Because Munsell did not feel compelled to “fit” his model into a geometric shape, he could account for a larger array of variation. The result is an asymmetrical color tree, closer to a color cloud, with different hues having different variations in value and saturation. It is interesting to note that it was only in the 20th century with Munsell’s system that we have a good color model. It is also interesting to note that a painter and not a scientist created this model! (The updated version of Munsell’s atlas, the Munsell Book of Color, by his son Alexander, is still in use). For Swain, Ostwald’s system is influential because the relations are based on harmonies, meaning the interrelatedness of the hues is apparent (Swain, March 18th). The problem, Swain discovered, was a lack of dark hues. Instead of building harmonies, Munsell’s system excels at exploiting all the lights and darks of a given hue, in large part because Munsell refused to constrict his studies to a predetermined geometry. 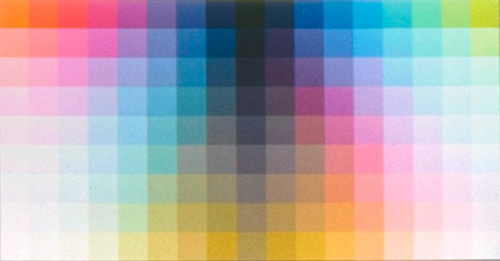 In the 1970’s, Swain began developing his color system. Swain’s color system divides color into 30 hues, 33 value steps, and up to 9 degrees of saturation (Swain, p.188). Compare this to Munsell’s system, in which each attribute of color has 100 hue steps (H), based on the five major colors and five intermediaries, each with ten steps; ten value steps (V) and an open-ended chroma scale © that could reach 12, 14 or more, depending in the stength of the color, resulting in a total of around 1,250 components. Swain’s color system amounts to 2,200. The colors he derived from his model do not exist solely in the theoretical paradigm, but from careful measurement and mixing by hand. This idea of the artist’s touch was also present when Swain created his color wheel. By staring at a particular hue and then establishing the after image as the complementary pairing on his wheel, Swain systematically went through each hue, to create a consistent spatial relation between colors in his devised system (Figure 3.). Seeing the three-dimensionality of color is important when looking at Swain’s work. 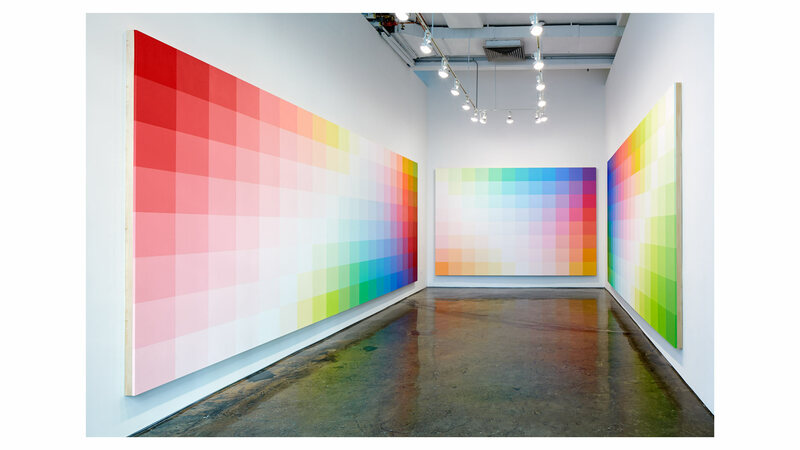 Because of the relationships he establishes between colors within a single work, the individual colors become autonomous agents, interaction and changing depending on contextual relations. The control of hue, value, and saturation in the work explores the specific relationships between specific colors, and, depending on these variables, they will respond differently to each other. This leads us to the topic of color sensation. There are three major classes of the interaction of color: simultaneous contrast, successive contrast, and reverse contrast (Ratliff, p.8). These in turn are determined by three major factors of color perception: composition, viewing distance and duration, and light source. Each is present in Swain’s work and will be described in turn. At the root of color sensation is the concept of simultaneous contrast, termed by Michel Chevreul in 1839. Simultaneous contrast is the law by which “two adjacent colors, when seen by the eye, will appear as dissimilar as possible” (Stromer, p.73). In other words, the perception of a color is affected by the color that surrounds it. This change is perceptual: a red hue does not literally lighten itself when placed in front of a violet background as opposed to a yellow, but our mind will “read” it as lighter. In successive contrast, the perceptual change occurs when observing one color and then replacing it with another. The optical mixing has to do with after-image, as we take the information or sensation of the previous color into our reading of the next one. For example, the same gray will appear greenish when adjacent to red but reddish when adjacent to green. The final is reverse contrast, or assimilation, color placed side by side may spread to adjacent regions, causing colors placed together to appear visually closer or more alike and a color takes on the hue of the surrounding color. An example would be a small white square placed on a larger red background and one placed on a larger blue background. The white square on the red background tends to look reddish, and that on the blue background becomes bluish. Again, the use of this technique lies in exploiting the perception of color, as each color is distinct in actuality but will combine in our brain to create uniformity. 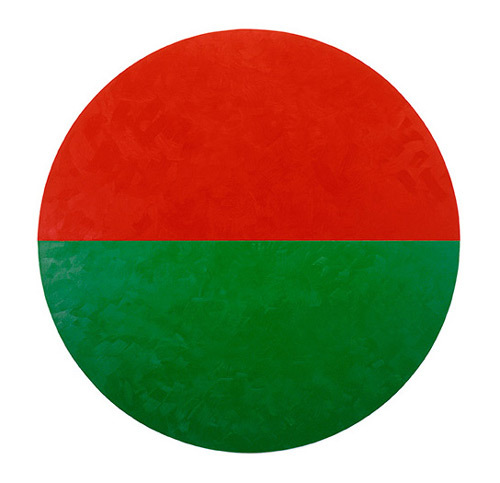 Swain’s Red and Green Circle Untitled, 1969 (Figure 4.) is a perfect example of Chevreul’s principles. The complementary hues, of equal saturation and value placed side by side, heighten the unique qualities of both, creating an almost jarring contrast. However, when looked at for a long duration, a strange effect occurs. First, a white light appears where they meet. Slowly, the colors optically mix, producing a neutral grey glowing around the complementary tones—not on the canvas, but in our mind’s eye. Three major contextual forces determine the three interactions of color: composition (referring to the size, shape, number and sharpness of contour of the components of a painting), viewing distance and duration, and light source. In essence, Swain only has control over one of the components: composition. Variables in viewing distance, duration and light source depend on the viewer and the placement of the painting; someone viewing one of his compositions in sunlight for an extended period of time will read what he sees differently than someone seeing the work in fluorescents while quickly walking by. “Balance is produced by the visual impact of the composition’s components of shape and color” (Arnheim, p. 350). Swain has established several fixed components in his study of color effect. For example, his composition by and large is based on a divided grid. For Swain, the use of the grid helps break color away from iconography (Swain, March 18th). The grid is basically passive, a vessel in which to carry color information. 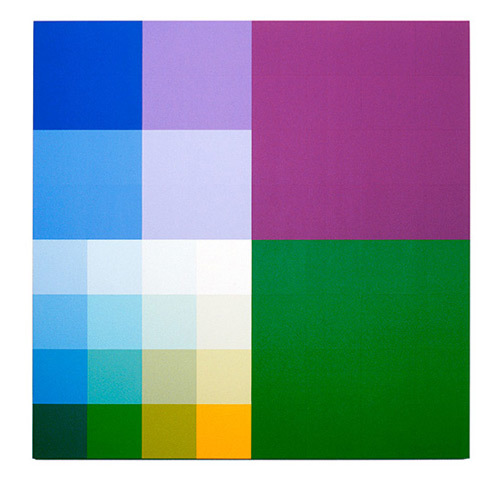 The sizes of the squares shift in Swain’s work, depending on the size of the canvas and the desired color effect. Also, the number of squares change, depending on the actual size of the painting and compositional balance. Often, Swain will break the grids into larger and smaller sections, juxtaposing more color contrasts next to a more block-like formation. All of these decisions are premeditated, and meant to direct the viewer’s experience. From his 2,200 units of color, Swain derives surprising combinations. For example, recontextualizing neutrals to elevate their presence on the canvas. “Even the colors that are very mundane seem to have a personality to me. They have a presence of substance. The problem is to find a context to exemplify the uniqueness of this, not in detriment to other colors but in and of themselves” (Swain, March 18th). 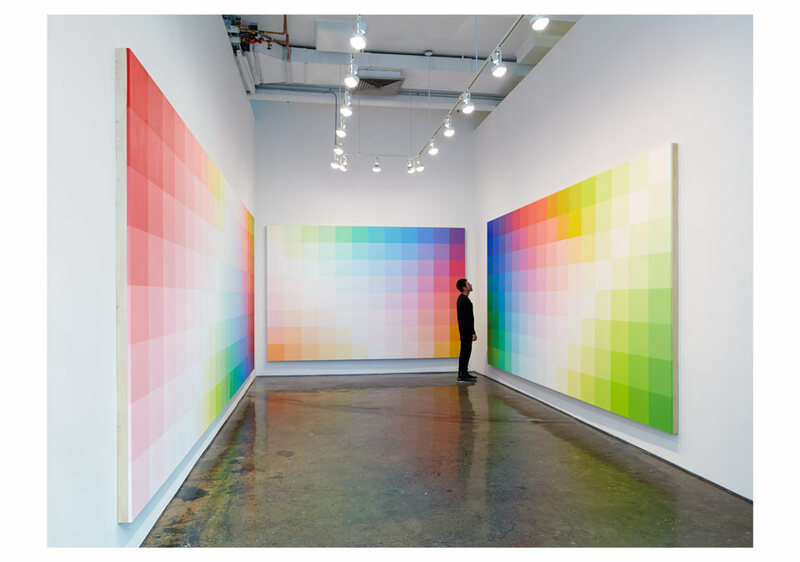 There is another experiential effect of Swain’s work that relates to color experience as laid out by David Katz. 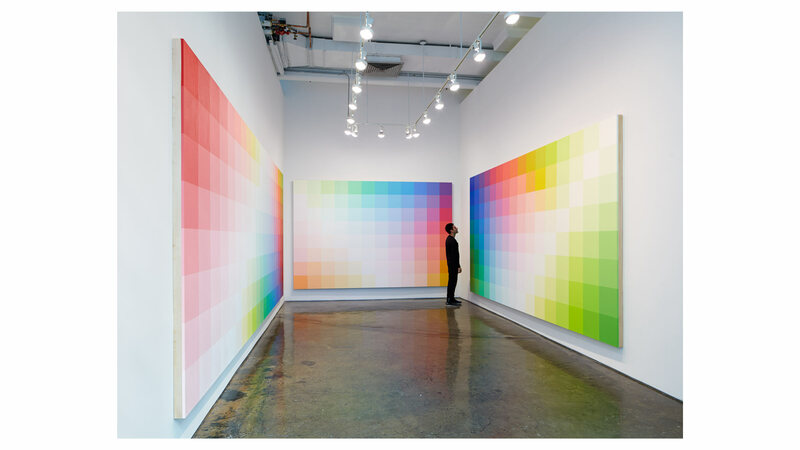 Katz classified three ways of seeing color: surface color, film color, and volume color (Evertz, p. 88), in surface color, the color is seen as innately tied to the surface of the painting. Film color is the effect of color floating off the canvas dematerialized, the same way we see endless sky or the hovering glow of an after-image. Finally, volume color fills a 3-dimensional area of space. Thus, in contrast to film color, you are able to see within the color itself. Swain’s latest work has introduced a critical new variable to the study of color painting: brushstroke. While still working within the confines of a predetermined grid pattern, he has added a textural, free form element to the application of paint. 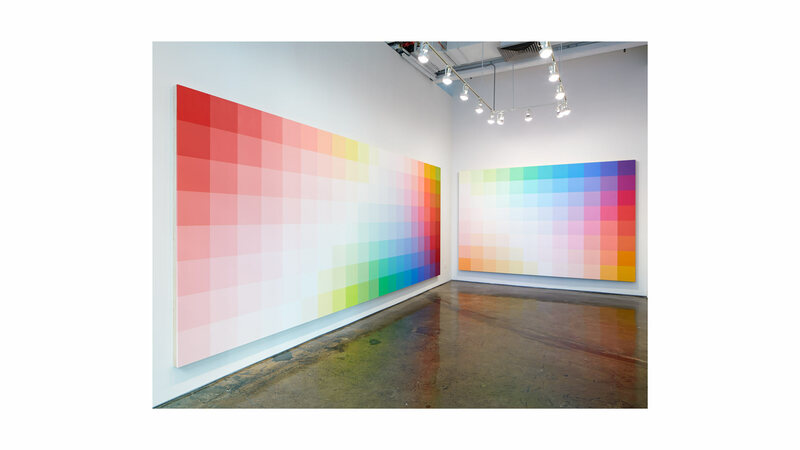 Primarily, Swain has directed his efforts to the interaction to two colors in each painting or grid section. Within a single work, he may vary the size of the brushstroke, but neither color dominates. Instead, they work simultaneously to highlight their inherently unique qualities without loosing any of their own. For example, in Figure 6., as soon as the blue catches your eye, it is equally transfixed on the red. The brushstroke seems to disintegrate toward the lower left quadrant of the canvas, but on closer inspection, the ratio and shape of pattern is proportionate and each brushstroke remains its own unique entity. Instead of modulation through color, the modulation within the painting is through brushstroke size. These latest series of paintings bring to mind the studies of Georges Seurat, who posited a harmony through synthesis of color (Protter, p.165). The tactility of brushstroke, for Swain, is another way of activating perception (Swain, March 18th). Through his Seurat-like synthesis of color, Swain maintains a dynamic equilibrium, allowing the new paintings to take on the same qualities as his older, but with a new perceptual twist, drawing greater attention to the relational quality of paint. The textural brushstroke emphasizes the surface color in a way his earlier paintings did not, but, because of the color juxtaposition, he still manages to create film and volume color. In this way, his latest work furthers his original studies while activating our eye to acknowledge another dimension of color—tactile movement of the actual paint. The usefulness of applying language to color perception lies in bringing the unconscious emotive qualities into an understandable realm. We may never be able to understand why we feel when we look at color relations, but we can understand how the color works. There is still the unknowable, which lies in the Goethe-like notion of subjective response. Robert Swain’s paintings elevate our understanding of perception, by activating and isolating ways of seeing that are usually taken for granted. This heightened awareness can only be felt but not grasped. As Swain himself has said, “this is something you haven’t experienced before. I cannot tell you how” (Swain, March 18th). 1.Arnheim, Rudolf. “The Expression and Composition of Color.” The Journal of Aesthetics and Art Criticism, Vol. 56, No. 4, (Autumn, 1998), pp.349-352. Blackwell Publishing. 2.Birren, Faber. “Color Perception in Art: Beyond the Eye into the Brain.” Leonardo, Vol. 9, No. 2, (Spring, 1976), pp105-110. MIT Press. 3.Burton, David. “Red, Yellow and Blue: The Historical Origin of Color Systems.” Art Education, Vol. 45, No. 6, (Nov., 1992), pp. 39-44. National Art Education Association. 4.Evertz, Gabriele. Light Sensations in Painting and Nature. Seeing Red: On Nonobjective Painting and Color Theory, pp. 84-96. Ed. Michael Fehr and Sanford Wurmfeld. Salon Verlag, Cologne 2004. 6.Ratliff, Floyd. The Theory of Color and Practice of Painting. 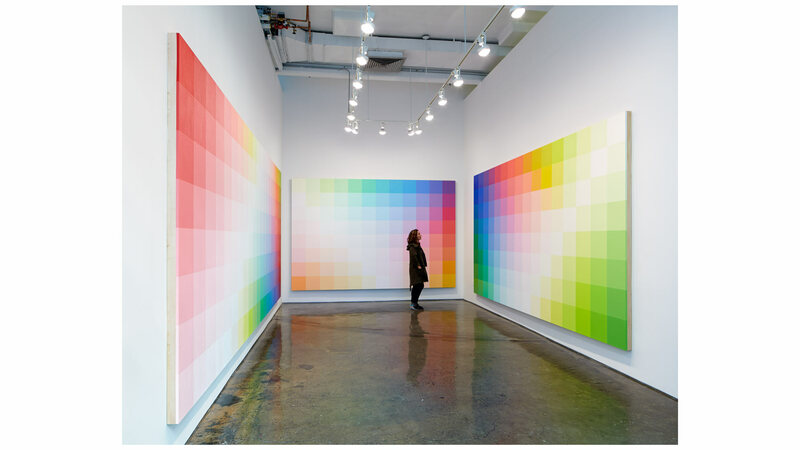 Color Function Painting: The Art of Josef Albers, Julian Stanczak and Richard Anuszkiewics, pp. 5-15. Wake Forest University Fine Arts Gallery, Winston-Salem, North Carolina, 1996. 7.Rossiter, Jill. The MLA Handbook: Rules for Format & Documentation. U.S.A.: D.W. Publishing Co. 2008. 8.Swain, Robert. Statement. Seeing Red: On Nonobjective Painting and Color Theory, pp. 188-190. Ed. Michael Fehr and Sanford Wurmfeld. Salon Verlag, Cologne 2004. 9.Swain, Robert. Personal Interview. 18, March 2009. 10.Stromer, Klaus, Urs Baumann. Color Systems. Trans. Randy Cassada. Konstanz: Regenbogen Verland Klaus Stromer. Germany, 1996.